In tandem with Kentridge’s visit, his video installation “7 Fragments of George Meliès,” with “Day for Night” and “Journey to the Moon,” will be on display at the Hartnett Gallery, Wilson Commons, from September 12-29. Hartnett Gallery is a student-supported, professional art gallery at the University of Rochester. 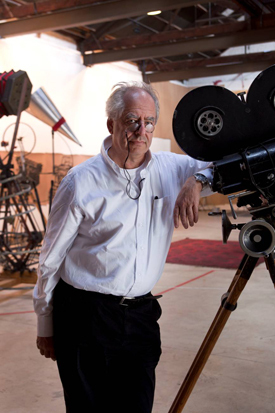 In September 2013, William Kentridge, the renowned South-African graphic artist, film-maker, and theater and opera director, came to the University of Rochester as the 2013 Distinguished Visitor in the Humanities. His visit was sponsored by the Office of the President and the College of Arts and Sciences, with the collaboration of the Departments of English and Art and Art History, the Film and Media Studies Program, The George Eastman House Museum of Photography and Film, Rush Rhees Library, the Humanities Project, and the Selznik School of Film Preservation.